My modifications of the Escape Hat by Angel Lea Designs have mostly to do with the fact that I wanted to pull my hair through the top of the hat. 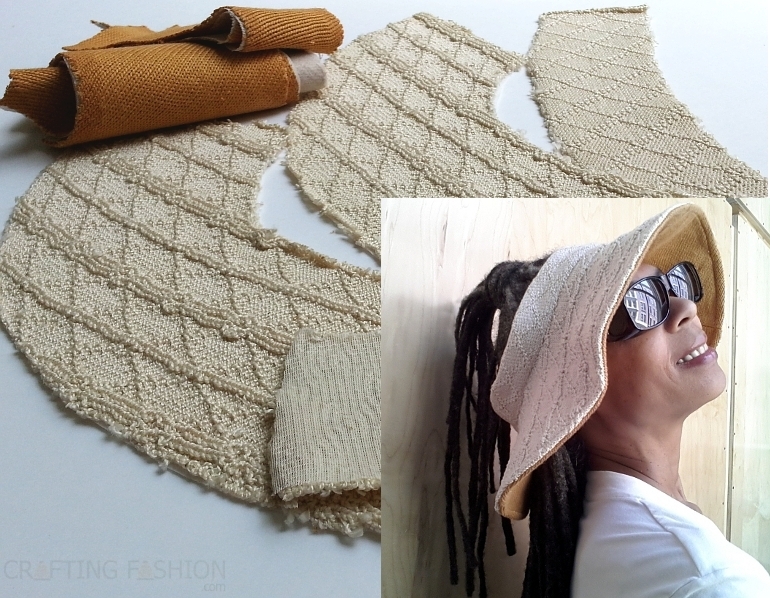 The Escape Hat is a great style and with a few modifications I was able to use the fabric I wanted. A similar pattern had been recommended to me by Andrea of Go To Patterns when I tweeted my need for this style of hat. I ended up buying the Escape Hat from Go To Patterns just in case I ever wanted to make a "man's version". The Escape Hat pattern is also available directly from the designer. I went wa-a-a-ay far off the recommended materials when I chose this for the brim, my custom diamond fabric for the crown, and a bamboo jersey for the lining. Next time I'll choose a lighter weight jersey for the lining. One of the things I learned when using a sweater knit for this pattern is that if you're using the various interfacings listed in the pattern instructions (and you should), the absolutely first thing you should cut out is the fusible interfacing. Follow the downloaded instructions for "Preparation and Cutting", but only cut out the interfacing for now. For the "Sunroof Edition" there's no need to cut out the hat top or contrast band. Fuse the interfacing pieces to the fabric and cut out the fabric. 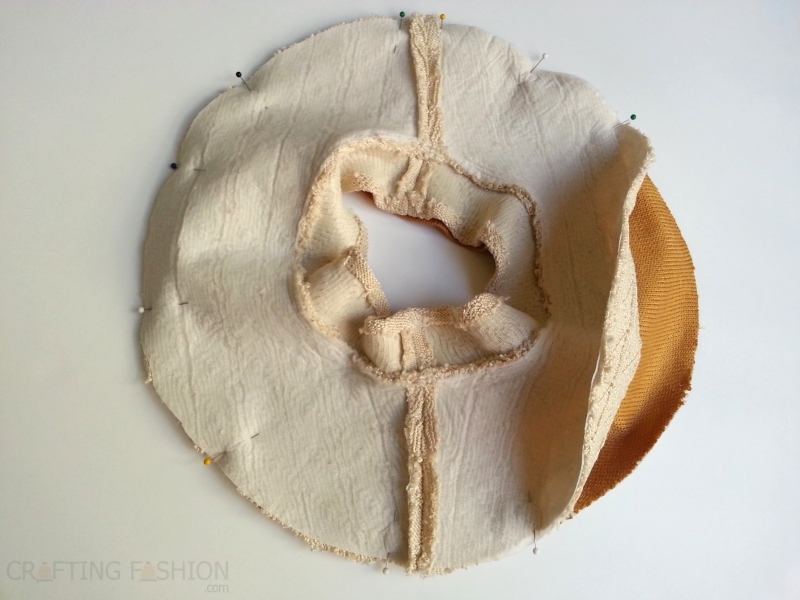 Use the cut out pieces of interfacing and place them on the wrong sides of the main fabric and lining fabric. Pay particular attention to the texture of these fabrics and decide where you'd like the fabric designs to match (or not). Be sure the main and lining materials are not stretched. When the interfacing is properly placed, tack each piece of the interfacing to the fabric in one or two places by touching the tip of your warm iron to the interfacing. Then fuse the interfacing to the fabric applying pressure with your hot iron. I find it's easiest to work with one piece at a time. 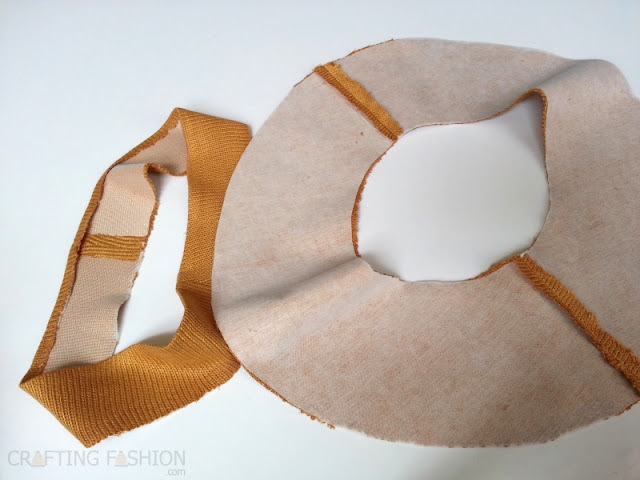 Cut the fabric using the fused interfacing pieces as your guide. Skipping any directions for the top of the hat or the contrast band, construct the hat and the lining following written instructions. I cut the crown of the main fabric and lining down about an inch or so, because I thought it would work better for my head and hair. I also pressed down 1/2 inch of the top of crown on the main fabric and lining in preparation for finishing. The weird thing, of course, is that once everything is fused, you can treat your sweater knit fabric just the way you'd treat any woven fabric. This has its good and its bad points. One of the things I love about knits is the stretch. Once the fabric is fused, the stretch is gone wherever you use the non-woven interfacing. The fabric will still stretch at the crown, where the knit interfacing is used, but I found the recovery to be slow with the particular knit interfacing I used. So why use a sweater knit at all? I used it for the texture. I love the texture of this fabric and really wanted to see it as the hat I imagined. If you're going with a sweater knit, I recommend using only a knit with texture or color patterns you'd like in a hat. The knit qualities serve no purpose in this hat. It's a trophy knit. After the hat and lining are constructed, pin the brims with right sides together and sew around brim completely. Turn hat right side out, press and ladder stitch the entire top edge of the crown. And that's it! The Escape Hat Pattern is really a gem. One day I'll make it as it's written.